It’s Easter and you know what that means – turkey time! Actually, any time is turkey time. Of course a whole roasted turkey is a favourite feature of family feasts, but truly, turkey makes a marvelous meal any day of the year! A whole turkey is versatile and value-friendly; cook one turkey and you can create several delicious, nutritious meals with the leftovers. Plan ahead! You can buy a whole turkey to cook on the weekend and feed your family for several days during the week. Enjoying more meals at home is one of the best things you can do for the health of your family. Cooking meals from scratch lets you control the ingredients and include more health-boosting whole foods such as turkey, veggies and whole grains. Meals don’t have to be complicated to be good for you! Here are three easy-to-make recipes that reinvent your turkey leftovers into traditional faves…with a twist! Everyone loves a turkey sandwich after a holiday celebration. This year, try something new: The Gobbler. The combo of sweet, juicy, crunchy grapes with roasted turkey is sublime. Turkey Talk: Turkey sandwiches are perfect for a packed lunch; turkey is lean, nutrient-rich and packed with protein to give you long-lasting energy that powers you through your workday afternoon. This Turkey, Apple, and Kale Grain Salad is ideal as a meal-in-one, filled to the brim with nutritious, real food ingredients such as turkey, kale, apples and farro (a whole grain). So much goodness in one beautiful bowl! Turkey Talk: I like to call turkey and produce the dynamic duo! Why? Not only does a turkey-veggie combo taste great, but it also boosts the nutritional value of your meals. That’s because the iron and zinc in turkey helps you absorb the iron and zinc in your veggies! Turkey soup is the quintessential leftover holiday food. Stock simmering on the stove, filling the house with its rich aroma, is one of the best things about roasting a whole turkey. Even if you have a favourite turkey soup recipe (who doesn’t?! ), I encourage you to do yourself a favour and check out this one. This Gluten-Free Turkey Pho is fantastic! I like to add in a bunch of baby bok choy, spinach or broccoli to make it a balanced meal. Give it a try! Turkey Talk: The stock for this soup is made with drumsticks. Dark turkey meat is lean and even more nutrient rich with more zinc, iron and selenium than white meat! So go ahead, enjoy those drumsticks at your Easter dinner! OR, keep them for making stock for this soup. Now you have three ways to make the most of your Easter turkey leftovers! What about non-holiday times? I’ll buy a whole turkey or a couple of turkey thighs or a breast – they cook quickly for a fast weeknight meal. 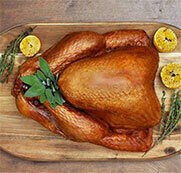 Ask your local grocery store or butcher about available turkey cuts.